Our operators and cranes doing the impossible. This extremely complex lift was performed in perfect unison between 4 cranes. Our 360 Ton, 175 Ton, 70 Ton and 45 Ton worked synchronously to lift a 260,000 lb. water tower in Waukee, Iowa. The water tower was raised 28’ and leg extensions were installed. We are the oldest and one of the largest providers of crane rental service in Central Iowa and to the Midwest United States. 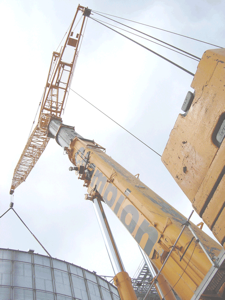 Since 1959 we have provided safe, reliable crane rental with some of the best crane operators and finest cranes available. Daily we join with construction and industry trades to provide lifting service to facilitate the expansive growth in the Midwest. At Champion we know the first and most important component to any job is customer service. That means professional, friendly service. It means being available 24 hours a day, 7 days a week, 365 days a year. Service means doing everything we can to meet your schedule and get your project done on time, and on budget. We offer free site evaluations, and provide CAD drawings of crane positioning for larger or complex projects. Outrigger loading is also available for most machines. Champion doesn’t stop with cranes though, we also offer rigging, machinery moving, trucking, and fenced outdoor storage. Give us a call, We look forward to working with you on your next project. ©2009 Champion Crane Service, Inc.